Today I made my weekly stop by the Caney Fork for a couple of hours and did very well for a change. The river has been tough lately with the fish appearing to be a bit leader-shy. Today was much better, perhaps due in part to my first experience with Fluorocarbon tippet. I finally decided to shell out the extra $$$ and I'm sold. We'll see how it does when the fish get spooky again though. The action was basically non-stop with seemingly every fish out feeding. My first fish was caught sight-casting. I had an indicator on but cast down and across to get the proper drift and watched as the fish moved over to eat as my indicator drifted over. The indicator never moved but I could see the fish had taken something and the hookset was sufficient to inform me that it had been my fly. After a lengthy battle, a chunky rainbow came to hand. I was very impressed with the healthy and overall quality of this fish. As the day progressed, the other fish that had obviously been in the river awhile all seemed in equally good healthy. Based on what I'm seeing now, as long as no disasters occur, the Caney Fork should fish exceptionally well this coming fall and winter. 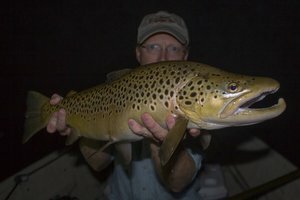 I'm expecting lots of good browns to be caught this next October and November so plan your trip now. After the first nice rainbow, I continued working up the river catching fish in just about every spot and seeing even more fish. I could have stood in one spot the whole time and caught fish but I like to keep moving around. After I had fished up as far as I wanted, I started to work back down as a storm was approaching. Lightning and graphite rods don't mix well and I wanted to get out in plenty of time. One spot needed special attention as good fish had been working on my way up but wouldn't commit to my fly. 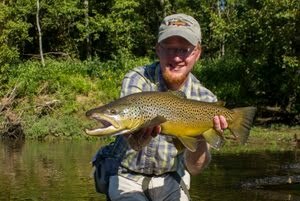 The first cast on the way down nailed the fish which turned out to be a beautiful brown. This fish I consider my consolation prize for the day. As I fought this fish, my thoughts turned to the big fish I had missed. 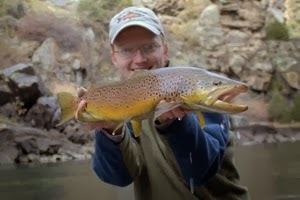 When I first got on the river I had hooked a large brown, somewhere in the neighborhood of 20 inches. It threw the fly before I could get it on the reel and left me staring at the spot where the great fish disappeared. It was particularly tough to lose because I have been trying for this fish for around a month now. I know where it likes to feed and today was the first time I was able to hook it. Thankfully there's always another time and I'm sure one of these days I'll land it as long as someone doesn't haul it out of the river. Originally planned as a South Holston trip, the Watauga was added into the mix when we discovered that they would be generating in the afternoon on the SoHo. I had been looking forward to this trip for awhile and stayed up tying flies the night before. It pays to be prepared and you can never have too many sulphur patterns. Sunday morning I was up at 4:00 (central) and headed out the door shortly thereafter to meet my fishing buddies on the east side of Knoxville by 7:00 (eastern). The drive was uneventful but the night before I had another of my premonitions indicating good fishing was sure to follow...and it turned out to be right again. We got to the South Holston by 9:00 and were soon fishing. I got things going quickly with a few stocker 'bows and then spooked a large brown. We worked down the river with everyone catching a few and then the pulse started to come through. The water never got too high and we stuck close to the edge of the river and then worked a bit farther down to continue fishing as the water slowly dropped back out. The rush of cool water seemed to slow things down briefly but it provided the apparent trigger for the sulphur hatch to start and soon the fish were nailing our nymph patterns as the sulphur nymphs started drifting in preparation for hatching. Soon the adults started appearing on the water and things just got better. The day became truly spectacular as fish after fish fell to our dries and nymphs. We had lots of doubles and even a few triples which tells you just how good the fishing was. My buddy Kevin took big fish honors on the SoHo with a nice brown of probably 15 or 16 inches that took his dry softly and then battled for awhile until we got it in the net. I missed at least two good fish but it wasn't the day for a big fish on this river for me. After fishing up until just before the generation was scheduled to start again, we headed back to the car and then off to find some lunch. After grabbing a bite to eat, we headed over the the Watauga to check it out. I hadn't been there before but Trevor assured us that it would be worth our time. It turned out to be an excellent decision as the fishing was just phenomenal. Despite dodging lots of water snakes and lots of lightning, we caught plenty of fish and I enjoyed my first time fishing this river. We finished up the day at a heavily used access and I finally got my nice fish for the day. 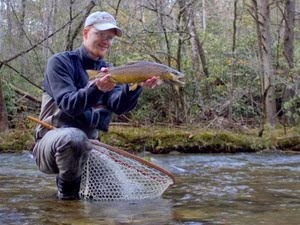 I was fishing a series of deep and very swift runs with a big Tellico nymph. Working almost to the top of one run, I cast up above it to allow my fly to sink all the way to the bottom of the run. Suddenly my line stopped and then darted upstream. Pulling back gently but firmly, I found what felt like a good fish attached to my line. Thankfully I was able to get it on the reel before it really took off and then the battle was joined. The fish bulldogged at first and then made short scorching runs downstream with my reel screaming. The fish finally came up and rolled a couple of times allowing me to realize that it was a nice rainbow. Eventually the fish tired and I worked it into the shallows where Kevin helped me land it and then we got a couple of pictures before watching it swim away. This spot proved good for a nice brown and another good-sized rainbow in addition to some smaller fish. I also had another big rainbow on but the fly popped out as I was applying a lot of pressure trying to keep it out of the rapids. Shortly after this, another storm was approaching and we all hurried back to the car and decided to call it a day. The trout of East Tennessee will be glad we don't make it up there often as we all caught lots of fish over the course of the day. The famed two-mouth trout really exists, at least sort of. The Trout Zone got in another couple of hours on the water and landed a uniquely deformed rainbow with at least one and a half mouths. I'll call it two but the lower mouth is mainly just a second lower jaw I think and the "main" lower jaw is split or something odd. Regardless, this fish is back in the river for someone else to catch so head to the Caney for this rare opportunity! I fished until I grew tired, the late afternoon and evening blended together in the growing fog from the cold river. The sun slowly slid out of the sky and over the hills, ushering in the shadows that signaled the approach of nightfall. I eventually quit fishing, not so much because of the impending dark but because the fog was becoming too thick to see my indicator dry and I didn't feel like blindly stripping buggers or softhackles. Fog, something we haven't seen in middle Tennessee for months it seems. The current drought conditions have kept things dry enough to generally prevent the development of fog. It was even cold, and in the middle of June no less. The frigid discharge from Center Hill Lake kept freezing my hands every time I had to dip them in the water to land my fish. You won't find me complaining. After days of temperatures in the mid 90's, I'll be downright glad to shiver for an hour or two. This next weekend is my trip to the South Holston. Hopefully the fishing will be good, even half as good as what I experienced yesterday would be fine. No it isn't a bike race... Originally supposed to be a Yellowstone trip (to go fishing of course), my trip west is starting to gain momentum and destinations. Colorado is most likely being added and hopefully this means I will once again fish the Gold Medal waters of the Gunnison for big hard-fighting rainbows and browns that will bulldog deep in the strong current. My last experience with this special place left me yearning for more and it looks like it might happen. This year will bring a new experience for me on this stream. Supposedly the terrestrial fishing is excellent in August and the way things are looking, the flows shouldn't be too bad this year as compared to last year where I was chucking heavy nymphs along the banks. Even with last years high water I still caught around 20 fish in probably 3 hours with lots in the 14-16 inch range and one big brown pushing 18 or 19 inches. I could go on and on about how tough life is when you have to fish as much as I do, and I could mention a few more of the streams I hope to fish where the average trout is around 5 pounds, but probably it isn't my place to make everyone jealous. Did I mention I'll be on the South Holston in a week or two? This should be a fun fishing trip since I've never fished it in the summer... In the meantime, I absolutely must start cranking out some flies. Perhaps the best catalyst for a great fishing story is the one that got away. As often as I fish and perhaps due to my skill level, I have more stories of this nature than I care to remember. Some are truly memorable though. 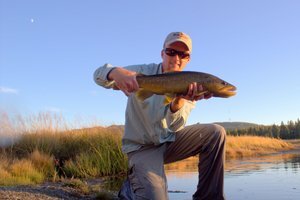 The brief connection to a large fish can be a magical moment, sometimes outshining any landed fish during a fishing trip. This year I've already had my share of memorable experiences. One occurred while I was fishing the Smokies probably a month ago. It was near sunset and I was at a large hole trying for a big brown. I worked up to the pocket water at the very head of the pool when it happened. The definite flash of rainbow was not what I was expecting. The fish leaped at my Tellico almost before it hit the water and then was gone with a souvenir. 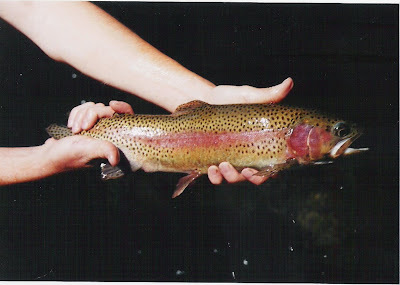 Big rainbows are not that common in the Smokies with a 12 incher considered a nice fish. Fish of 14-16 inches are large and this was larger, probably 18 inches and extremely fat. I haven't gone back yet but I'm confident that it will still be there next time. Fish don't get that big unless they are smart. The next moment of connection was last Sunday. I was on my way to Nashville for the week and stopped at the Caney Fork to fish for an hour or so. The water was picking up speed as the generation pulse approached. As always, I just had to try a few more casts. A nice cast placed my fly on the far side of the channel where I knew good fish liked to feed. The dry I was using as an indicator suddenly sucked under and I gently lifted the rod. There was an eruption from the place my fly had vanished as a big rainbow took to the sky. Three jumps and a couple of short runs later I was beginning to think I would land the fish. Of course the fish had other ideas and decided to head downriver. The determined run seemingly could not be checked and then the line went limp. Dejectedly I checked my flies. The zebra midge dropper was still there, the fish had simply thrown my fly. Oklahoma can get pretty interesting once the sun goes down. For starters, the sunsets can be spectacular. We didn't get to witness any particularly interesting ones but they were quite nice still. As the darkness deepens over the landscape, the creepy crawly critters come out to play. I've always been intrigued by snakes despite a rather healthy respect for them. This has led to the enjoyment of slowly driving back roads at night after the sun has gone down looking for new and interesting snakes to photograph. My goal is generally to find a rattlesnake but usually the best I can come up with is a copperhead. This night was no different from the norm except that the copperhead I found had a serious attitude problem. The little guy wanted to chase me around. After getting back in the car and letting the snake cool down a bit, I cautiously got out again and this time it stayed still for some decent pictures. Getting chased around the dark Oklahoma countryside is tiring business and shortly thereafter I retired for the night. The next day would bring slower fishing but I did manage the best bass of the trip, albeit not very large. A stroll down a country road allowed me to check on the local bovines. They all seemed to be doing rather well but were very curious. I decided maybe they just wanted their pictures taken and obliged with a few shots. I'm always glad when the cows are behind a good solid fence. There were a few frightening experiences I had earlier in life involving free-ranging cattle hanging out on roads I was travelling. The funniest was when I was headed south back to Arizona from Moab, Utah. I was rolling through the Navajo reservation when suddenly, ghostly colored forms appeared to be floating all around me. Probably the sheep and cows were more frightened than I was but you probably won't be able to actually convince me of the fact. Whatever the case, ever since I've believed that the place for such creatures is behind a fence, or at least, not wandering the highways in search of some poor traveler to terrorize. Scheduled for the fourth day of the vacation was a trip to the Tallgrass Prairie Preserve near Pawhuska. Normally we slowly drive the roads through the preserve, viewing plenty of bison in addition to the wide array of local birds. This particular day the bison were not cooperative. The nearest we came was probably a solid half a mile away. The scenery was still nice though and well worth our time. I decided ahead of time that the last day would be dedicated to the long rod. By mid afternoon I finally got away down to the creek and started fishing. Right away I had a nice fish on the popper but then things slowed down. Finally I settled on the popper with a simi seal leech dropper and this seemed to be the best solution. The gar never did come around much so I didn't really get any good shots at it. The panfish were more than cooperative though and made the afternoon enjoyable. After a nice few days in Oklahoma visiting relatives, fishing, and being lazy, I'm finally back in Tennessee. I spent parts of several days fishing in the creek and had a good time catching plenty of panfish and a few small bass. Unfortunately, the gar never cooperated and neither did the carp I spotted during the last afternoon of fishing. The last day was strictly dedicated to fly fishing which I felt would provide the best opportunity to catch the gar. Of course, the fish would have to choose to not show up the last day until just before quittin' time. A few fruitless casts later, the gar vanished for good. Oh well, there is always next time. Anyway, enough rambling. I took lots of pictures over the last few days and thought I would share a few, some of the fishing and of course, other random pictures. On the way out, we took the "Missouri" route which takes us across the southern portion of the state. We crossed the Ohio and Mississippi rivers and noted that shipping is alive and well on both rivers. The trip out was uneventful and we were glad to arrive at our destination in the Bartlesville vicinity. Our first full day there was absolutely gorgeous and a prime example of why the plains states are so nice to visit this time of year. Late spring in Oklahoma brings some of the most vivid colors to be found anywhere with the greens of the prairie stretching away for miles. The oil business seemed to be doing just fine, a fact I'm sure President Bush and Vice President Cheney are far too happy about. One of the sure signs of the season, a young warbler of some sort was seen leaving the nest and held still long enough for this closeup. A few hours later the whole family had disappeared into the brush, the only clue of their presence the chirping of the young ones. Of course, I know everyone is probably here to read about fishing. As mentioned in a previous post, the first day or two was relatively unproductive but then things picked up nicely. The first day of fishing was strictly with a spinning rod as the creek was still awfully muddy and the small spinnerbaits did a much better job at drawing fish then any of my flies and popping bugs. As soon as I started fishing the small spinner, I was into fish like this one. A few were smaller and a few larger but most were around this size. They provided a lot of fun and were a whole lot easier to catch than trout, not a type of fishing I do every day but a good time regardless. That finishes the first couple of days of the trip. There are lots more pictures to come including of the small stream bass I managed to fool and the copperhead I found on a lonely country road one evening. Check back soon!!! Due to the ultra slow dial-up I'm using, my posts are being made without pictures for the time being. This means I will attempt to whet your appetite for the pictures to follow in a few days because I'm not going to sit here long enough to upload them. I'm on vacation afterall... Between snake hunting and fishing, I've managed to keep relatively busy. The creek out back was up and muddy the first couple of days I was here, limiting the fishing potential. Finally I took my spinning rod (gasp, no the Trout Zone doesn't follow purist philosophy) down with a small spinner and caught several various sunfish and a small bass. Wandering down the creek I spotted what appeared to be a gar or pickerel. Having never caught either, I spent some time trying to get it to strike but went unrewarded. Today I went fishing again, catching a better bass (at least for the size of the creek) and getting the long nosed toothy fish from the previous day to give chase to my spinnerbait. Once again I failed to connect leaving me to spend this evening pondering just how to catch it. Its got to be the fly rod I've decided. The few times I saw the fish appearing to feed, it seemed to be on the surface. Tomorrow I will go down to the creek again to give battle to the toothy monster, assuming I don't run into any dangerous critters on the way. Speaking of dangerous critters, not wishing to fish at night with all manner of frightening animals lurking about, a recent evening was spent hunting snakes. How is that safer than the creek? At least I KNOW where the dangerous animals are at. I spent awhile driving the backroads looking for any interesting snakes to photograph, hoping to find a rattler. Instead I was rewarded with just another copperhead. I've seen quite enough of those in my life and really don't care to see another, especially after last night. The crazy thing was grouchy and decided to chase me. Usually they keep calm while the bright lights from the car shine on them, allowing me to get close enough for a good picture. I've photographed both copperheads and rattlesnakes this way. This copperhead had other ideas though and promptly chased me back to the car. A few minutes were spent donning my headlamp in preparation of round two. After attempting in vain to get a decent photo from the window, I gingerly stepped back onto the road towards the snake. This time it held relatively still for a series of pictures which will be showcased here in a few days. Life on vacation isn't dull at least! Book Review: "So Many Fish, So Little Time"
I was determined to write a book of fishing dreams. A book of dreams, a wish list of all the best places in the world to fish. This is a sit-on-the-pot kind of book, the type of book that sometimes inspires you to get off your duff and make plans, the type of book that is fun to pick up, knowing full well you can't afford to visit New Zealand until little Bobby finishes college in ten years, but you still read it and wish. A sit-on-the-pot kind of book is a good way to describe this book. You can spend just a few moments with it and start yet another fishing daydream rolling. As I read, I often encountered sections that provided an opportunity for remembrance. Remembering all the great fishing places I've been fortunate enough to go to throughout the years. Places in Arizona, Colorado, Wyoming, to mention a few and of course my own home state of Tennessee. It was in the section on Tennessee that I realized better some of the difficulties of writing such a book. The author describes a river I frequent in the cooler seasons, the Hiwassee. The difficulty I specifically am referring to is apparent when the author says that it is "one of the top twenty trout streams in the country." Obviously the author hasn't fished the Hiwassee for several years. Back in its heyday the statement would have been accurate, but not now. Don't get me wrong...it still fishes very well but nothing like the good old days. The author also says "humongous trout and plenty of them." Once again, there are still large trout but nothing like years ago. This is the big difficulty of writing a book like this. You can't possibly fish 1001 places in the last couple of years and great fisheries fluctuate. Places that were great 5 or 10 years ago may only be average fisheries now. Of course, this isn't the authors fault fully, he is writing based largely on his experience. When you check out this book, keep this in mind. Enjoy the book, especially enjoy the stories, and dream. If you do this, especially if you dream, the author will have accomplished his goal. He wrote this book to inspire fishing trips and dreams of fishing trips. As I said, the stories are great. The author is definitely a gifted story teller even though many stories have to be kept very concise for space concerns. From a new fishing buddy that pulls out a gun to randomly shoot towards the pronghorn antelope to an epic day on the Yellowstone, the stories will keep you reading looking for more. One of my favorite stories I could relate to very well. The author hooked a large fish on the Taylor only to lose it. My first day on this stream full of hogs was slow until I hooked a large rainbow in the 7-8 pound range. I started hollering for my buddies to bring a camera and drew a crowd of spectators with the commotion. After several tense moments I gently eased the trout towards my net only to have to tiny zebra midge pop out as the large 'bow slipped back to its midstream lair. Yeah, I understand the frustration that the Taylor generates at first. However, once you understand it the fishing can be a blast. That is the way this book is. You read a little and immediately start reminiscing or daydreaming. I honestly couldn't put it down for awhile after I received this book and will continue to read and re-read any time I want to dream about great fishing places.